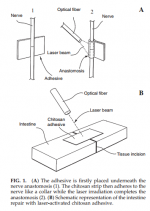 Sutureless nerve repair with laser-activated chitosan adhesive: A pilot in vivo study. Antonio Lauto, Leslie J. Foster, Albert Avolio, David D. Sampson, Colin Raston, Maria Sarris, Gavin McKenzie, Marcus Stoodley.